I am reposting this article so more people will have the chance to read it. I am hoping its author, Herbert Docena, will not mind my doing so. I am glad to see he is a young man who may never even have experienced the worst excesses of the Marcos years. But he has read his history books and he has obviously spoken to many people who, like me, did live through it. Why, nearly three decades after his death, have the Marcoses and their supporters adamantly refused to just bury the late dictator Ferdinand Marcos beside his mother in Batac, as he himself reportedly wished? Why have they never given up on getting a “heroes’ burial”? Why in short do they refuse to “move on”? The answer has become clearer now: They do not actually want to bury Marcos, they want to keep him alive. They want to raise Marcos back from the dead – not as the vile, hated murderous kleptocrat that he really lived as, but as the beloved, glorious Father of the Nation that the Marcoses and their supporters have always projected him to be. They want to reconstruct the Marcos brand to new and future generations of Filipinos in order to buttress the ever-strenthening political clout of the Marcoses. They want to efface the sign of the beast stamped on the forehead of the Marcoses; to wash the blood off their hands; to remove the stench of murder that clings to the House of Marcos. This, many have pointed out, is clearly about reclaiming Malacañang. It is part of Bongbong Marcos’ early presidential campaign for 2022—and perhaps even Sandro Marcos’ campaign in the not-so-distant future. The caravan of hundreds, if not thousands, that they will likely organize to accompany Marcos’ cortege from Batac to Taguig will be an early show of force, announcing the younger Marcos’ bid for his father’s old post. But it is also about much more than this. 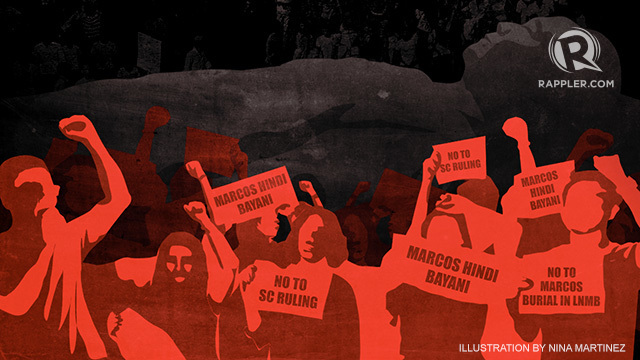 Marcos, after all, was not simply a murderous, kleptocratic dictator. He was also a murderous, kleptocratic dictator of a particular stripe. He was a dictator who, faced with fractious parasitic dynasties and resurgent communist and separatist movements, sought but failed to “modernize” Philippine capitalism by introducing and propagating his own fascist ideology: the idea that there are no conflicting classes in the Philippines, just one proud “nation,” and that all should just unite behind him and agree to be disciplined by the state in order to create the Bagong Lipunan. Parading his body down from Ilocos to Taguig, burying him as a “hero” and rewriting the history books is also about resuscitating and re-propagating this once dominant ideology. In short, it’s not just about rehabilitating the Marcos brand, it is also about reviving Marcos’ values and visions. It’s about reviving fascism. Seen from this perspective, it becomes easier to understand why President Duterte has been so intent in granting the Marcoses’ requests. Duterte wants to bury Marcos as a “hero,” not just because he wants to repay his campaign financiers but because he too espouses Marcos’ values and visions. After all, Duterte seeks to achieve very similar goals in the face of conditions very similar to those Marcos faced. Catholic nuns and supporters of the EDSA people’s revolt greets a soldier on board his V-150 armored tank at EDSA. He too seeks to “modernize” a society that continues to be bled dry by dynastic, parasitic elite families; he too seeks to pacify active (if relatively weaker) resistance movements. So he too has been propagating an ideology very similar to what Marcos propagated: the need for class compromise, the importance of discipline and law and order, the vision of a Bagong Lipunan. Marcos’ planned burial at the Libingan ng mga Bayani is therefore not simply a ritual to achieve closure or pay off debts but one more moment in a concerted and protracted political mobilization to create the social and ideological preconditions for fascism. It is about “rewriting history” not to change the past but to rule out a more democratic future. This is why those of us who oppose the Marcoses, who oppose dictatorship, and who oppose fascism have no choice but to fight back. We can still stop Marcos and Duterte if enough of us organize and if enough of us are willing to put our bodies on the line, stand our ground – and possibly even risk arrest– in order to physically prevent Marcos’ body from touching the grounds of the Libingan ng mga Bayani. In other words, we can still stop Marcos and Duterte if we engage in mass nonviolent civil disobedience actions on the day of Marcos’ burial. 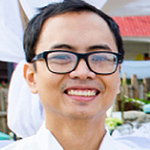 Herbert Docena is a PhD candidate at the University of California, Berkeley. To take part in, or to support, the planned mass nonviolent civil disobedience action to #BlockMarcos, email: haranginangdiktadurya@gmail.com. The dispute over the burial of Marcos in the Libingan ng mga Bayani is about remembering and forgetting, about moral and immoral values, about honor and dishonor. Those lobbying for a place in the LNMB for Marcos are saying “forgive and move on”. The question is: by moving on, do we move forward? All indications are we are moving back, to the Marcos years and his cronies and Martial Law ideology. Look at who are back: Imelda, Bongbong and Imee, Joma and Misuari, Gloria Macapagal Arroyo, Erap… Moving on? Forgiving is one thing, forgetting another. You may choose to forgive, that is a virtue; but forgetting betrayal and the direct cause of an injury, only opens one to a repeat of the same tragedy. If you let the same harm to be done to you by the same person under similar circumstances,—that would be fool hardy. You would be responsible. As the saying goes, —“fool me once, shame on YOU, fool me twice, shame on ME”. And now, we are hear a familiar song, we have been there before, are we expected to swallow the same old line dangled before us? Iba ang Magpatawad, iba ang CONSENTIDOR. “The clandestine burial of the dictator Marcos was obviously done not to heal old wounds, but to spit on the face of Martial Law victims and their families, as well as disregard the aspirations of a nation still yearning for justice after 20 years of corruption, burdened with trillions of pesos in debts that will be passed on to future generations of Filipinos. “This burial was evidently planned in dark secrecy; such plans can only hide sinister motives. Why did the Duterte administration not wait for the Supreme Court to re-evaluate its decision, knowing that a motion for reconsideration was underway? The timing is likewise suspect, with the President out of the country and the people having no means to appeal to him to reconsider or even postpone his decision. “If this were a movie, the plot would be worthy of an award for outstanding workmanship. “The victims of the Marcos regime — which is the entire nation, unless history is revised – are now left with little relief. But we do need to ask who paid for all of the burial arrangements, from the transportation of Marcos’s remains by helicopter to the mobilization of 500 soldiers, which Malacanang has asserted it had no inkling of?